Jacqueline P. Miller joined the faculty at Lakeview Middle School in 2013. She is the Director of Bands at LMS and Assistant Director of the LFO Band. Mrs. Miller received her Bachelor of Music degree in performance and music education from The Eastman School of Music, where she was a member of the prestigious Eastman Wind Ensemble, and her Master of Music degree from The University of Alabama. Her teachers have included Mark Kellogg, principal trombonist of the Rochester Philharmonic Orchestra, and Demondrae Thurman, world-renowned Euphonium soloist. As a performer, Mrs. Miller has performed for a wide range of audiences throughout the United States, at venues such as Eastman Theater, Kilbourn Hall, Koussevitzky Shed and Ozawa Hall at Tanglewood. She toured Italy with the Massachusetts Youth Wind Ensemble and performed for Pope John Paul II in Vatican City. She performed on the Canadian Brass & Eastman Wind Ensemble’s album Manhattan Music (Opening Day Records, 2008). She has performed with the Gulf Coast Symphony and Chattanooga Symphony Orchestras. Mrs. Miller is a member of the National Association for Music Education, Georgia Music Educators Association, the Georgia Association of Jazz Educators, the Jazz Education Network, and the International Tuba and Euphonium Association. 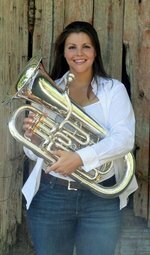 Mrs. Miller is a professional Euphoniumist and has a studio of low brass students in the area. Originally from Belchertown, MA, Mrs. Miller lives in Ringgold, GA with her husband, trombonist Eric Miller, their daughter Natalie and three dogs, Toby, Milo and Lucky.